This stainless steel fermented Gewurztraminer exhibits aromatics of orange zest, jasmine flower, and green tea. The palate is mouth-watering with balanced notes of candied ginger and orange marmalade, followed by baked pear, rose water, and a touch of jalapeño. Fermentation: 80% fermented in stainless steel, and 20% fermented in old oak barrels. The barrel fermented lot aged on its lees for 8 months. Aging: Aged in the cellar for one year, and in bottle for one year before release. Reminiscent of 2015, spring afforded the 2016 growing season with a slow start. With a cool and adequately wet April behind us, May initiated a warm dry period that would last throughout much of harvest. Each month after April signaled higher than average Growing Degree Days, and many commented that 2016 was shaping up to be more akin to a warm climate vintage. Although the sun and draught went well beyond “average” conditions, fears of greatly reduced acids were allayed by cool nights that kept pH and tartratable acidity in check. In some vineyards with shallow soils, drought conditions stalled sugar accumulation, but in others, sugar accumulation continued afoot. 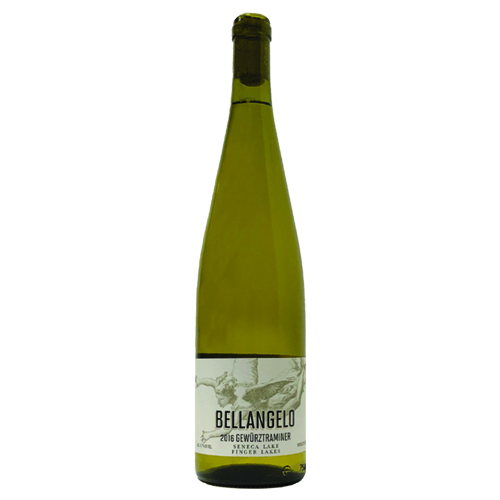 In all vineyards that Bellangelo works with, berry sizes were slightly smaller, yields were slightly larger, and berry quality was extremely high. Additionally, the extremely dry conditions also reduced disease pressure.